1. 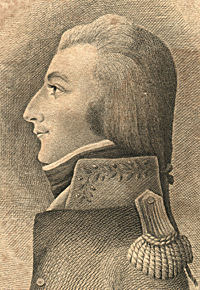 Life of Theobald Wolfe Tone, founder of the United Irish Society and adjutant general and chef de brigade in the service of the French and Batavian republics. Edited by his Son, William Theobald Wolfe Tone. vol. i p. 1. Washington : Gales & Seaton, 1826. Portrait frontispiece by Katherine Sampson Tone, engraved by W. Harrison, Georgetown, DC. 2. Neither the two-volume collection of his papers, Life of Theobald Wolfe Tone (1826) nor The Autobiography of Theobald Wolfe Tone, abridged and edited by Sean O'Faolain in 1937, contain any reference to Freemasonry. The 1893 edition by Barry O'Brien "omitted the letters, the political esseys, the account of Tone's family after his death, and some minor material." "There is also a French edition of the Autobiography with the title Mémoires secrets de Wolf Tone (Paris, 1888.)" [O'Faolain, xxvii]. A death-mask, the original manuscript notebooks and Farrell's bust of Tone are held by Trinity College, Dublin.